A card game is something that the entire family can have fun with, and it helps children and parents interact with each other in a way that they normally don’t, mainly because of the extremely hectic lifestyles of most parents these days. Choosing a card game for the entire family is a very subjective thing, you just have to play it and judge whether it is a crowd-pleaser. Any game that makes you and your kids feel happy, helps you bond together and share ideas, thoughts, etc. is a great game for the family. Okay, below you’ll see that we have listed some of the best family card games currently available on the market. We have reviewed some of the most popular bestsellers, and we tried to include games of different genres in the list so that you can choose from the widest possible selection. Try to think about what the kids would like, then choose the card game that you think would be better for the collective family. Do you like kittens? Do you like explosions? Well, combine them together and you get this amazing game that happens to be the most backed kickstarter project ever, as well as the most funded game in kickstarter history. This is basically like a card version of Russian-Roulette with kittens, goats, bombs, defuse kits and more. Basically, members of the family take turns in drawing cards until someone draws an exploding kitten. 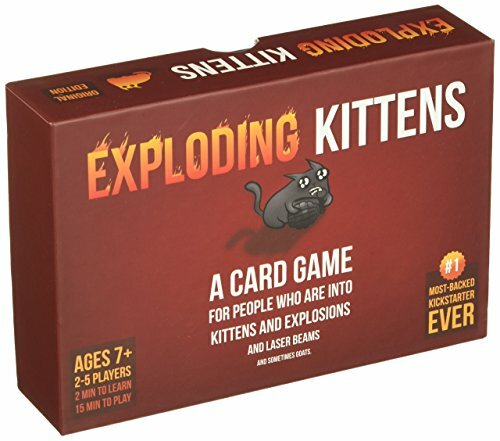 That person then “explodes”, dies, and is out of the game, unless they have a defuse kit card which can be used to mitigate the exploding kitty attack. Defuse cards include belly rubs, catnip sandwiches, etc. All the other cards in the deck are used to move, dodge, and avoid the evil kittens. This game is like a more action packed version of UNO, complete with goats and kittens and dynamite. The illustrations on this card game have been done by “THE OATMEAL”, and one set of cards is enough for 2-5 players, with a secondary deck you can get up to 9 people to play the game at the same time. Suited for ages 7 and up, also it barely takes 15 minutes per match and requires like 2-3 minutes for learning. Are you into Japanese food? Do you like Bento boxes and Sushi? 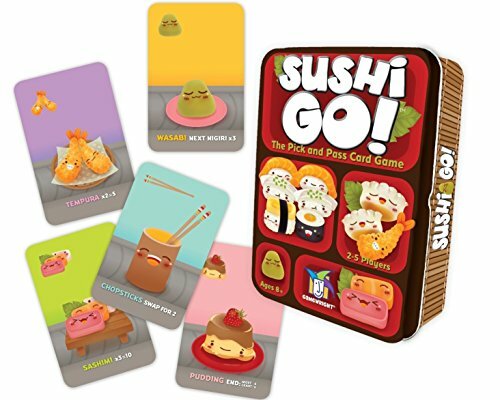 Then take a look at this incredibly inexpensive and highly simplistic family card game based around cute little Sushi characters. The game includes a set of 108 cards, and is designed to be played by anywhere between 2 to 5 players at a time. It has been designed by the renowned family game manufacturer Gamewright, and is suited for kids above the age of 8, although that number can be brought down to 7 or even 6 with some parental guidance. This board game is pretty fast-paced and everyone’s goal is to grab the best possible combination of Sushi dishes as they pass around from player to player. Points are fixed for different combinations of dishes, as well as specific dishes themselves. Score high by making the most maki rolls or by collecting a full set of sashimi. Get some wasabi along with your nigiri in order to grab bonus points, and make sure to leave some room for desert in order to save yourself from point deduction in the end. This game teaches people a lot about different types of Japanese dishes, and it allows the entire family to come together and engage in friendly competition which ends with happy people and smiling faces. Designed for anywhere between 2 to 4 players, this is the perfect educational family board game if you are a family of 4 with two parents and a couple of kids. Anyone above the age of 6 can enjoy this super fun card game, and each session barely takes 20 minutes of your time. The box contains 60 turtle cards, 21 tokens, and some instructions that you’ll find really helpful because normally it takes only 3-5 minutes to fully understand the basics as long as you follow the simple instructions. This is a classic memory based game and helps kids learn left from right, as well as the values of numbers. 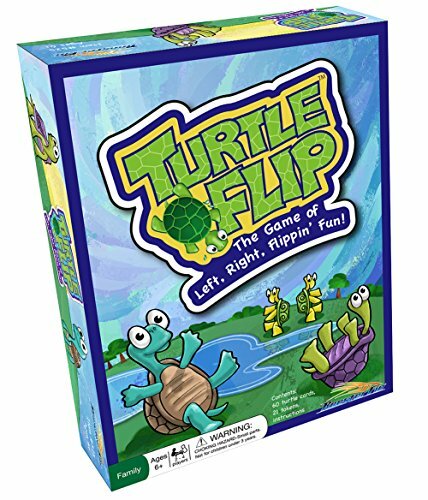 The objective of this fast paced game is to win “FLIP” tokens by playing certain high number or high value turtle cards. Basically like a game of musical chairs or hot potato, in the sense that the player with the best card wins when everyone stops moving. Designed by the creators of the incredibly fun to play “Turtle Flip” game, this is another extremely intuitive family card game which is pretty easy to learn yet fast paced. Like the turtle card game, you flip rooster cards to win corn points, and the player with the most corn at the end of the game wins. This game is slightly different in terms of function and strategy however, since it is more prediction based rather than memory dependent. 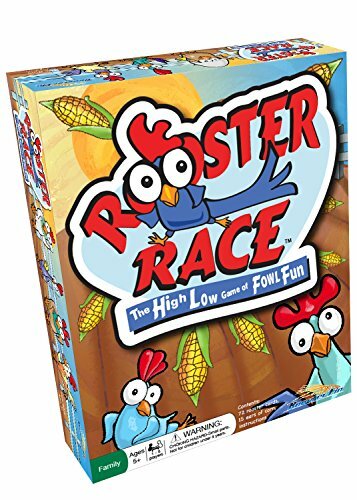 Rooster Race can be played by preschool kids, teens, college students, parents, and grandparents, and a game hardly takes more than 15-20 minutes to complete. Suited for anyone above 5 years of age, and can be played by 1-5 players at a time (please don’t play it alone!). The box contains 72 rooster cards, 15 ears of corn, and some instructions. There are tons of card games available on the market these days, so take a look at some of the most popular ones first. It is true that what other people like might not be the best for you, but there is a greater chance that you’ll like it than you not liking it, if it has already been tried and tested by so many people worldwide. First, take a look at what type of game it is – puzzle solving, quest, business, or just something totally different. If you’ve already owned some card games in the past, make sure that the one you’re getting right now is something that is totally different, so that you and your kids can get more involved in it, since newer games take more time to learn and ask for greater interaction and coordination between family members. Finally, try to check the materials used in the making of the card game. Is it cardboard? Or is it plastic? Or maybe it is wood. If it is wood, make sure that the pieces are all well finished and there are no splinters or sharp ends anywhere. If it is plastic, check the specifications to see if the plastic is BPA and phthalate free, also check out the recyclability of the plastic (it is always a good thing to train your kids about the environmental impact of things from an early age).